In 2000, after five years of research and writing, my article Escaping the Matrix was published in several print magazines, and it was the first of my articles to go viral on the net. I’ve learned a lot since 2000, but the article still serves as a ‘red pill’ awakener from the trance of the mainstream matrix. Hundreds of readers have written to me over the years, thanking me for opening their eyes. By 2005 my ideas had reached a certain level of coherence and completeness, where I felt they deserved to be communicated in book form. 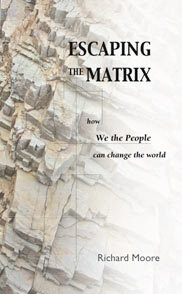 Escaping the Matrix (the book) presented my answers to the questions, How does the world really work? How did it get that way? How might we change it? How might a more sensible world operate? I’ve learned a lot since 2005, but the book stands the test of time – it is a depth analysis, and what I’ve learned since amounts to ripples on the surface. In 2010, another of my articles went viral, The Elite Plan for a New World Social Order. The article tells the story of the rise of industrial-age capitalism, and the transformation in geopolitical dynamics that accompanied that rise. The article explains how two-centuries of capital accumulation has served as a vehicle to bring financial elites to the pinnacle of power, and how capitalism is now being abandoned by those same elites. They have been preparing for a post-capitalist system since at least 1972, when the Rockefeller-sponsored Club of Rome published The Limits to Growth. The article also presents a vision of what kind of society they seem to be aiming for with their various social-engineering initiatives. In 2013, I published another widely distributed article, The New World Order: the endgame has begun. This article tells the story of the past two centuries from a different perspective. It tells the story of elite machinations, of how wars, revolutions, and financial manipulations have been orchestrated so as to bring the world step-by-step closer to centralized management – and how these dramatic events have also served to enable experimentation with radical forms of social control (Nazism and Stalinism).